A writer and creator in the Stargate franchise of TV shows, Joseph Mallozzi is a major player in the world of geekdom. 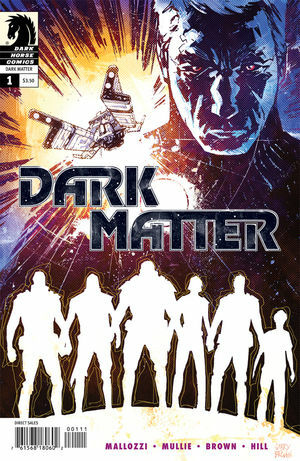 Thanks to Aub Driver and the fine folks at Dark Horse Comics, I was given the chance to talk to him about his new comic project, Dark Matter. Check it out! GCC: Geek Crash Course is designed to be a resource for newcomers to geek culture: comics, movies, video games, anything. Can you give us a Geek Crash Course on Dark Matter? Mallozzi: A crew awakens on a derelict ship dead in space. They possess no memories of themselves or each other. They have no idea how they got on board or where they’re headed. Their search for answers leads them down a dark path fraught with deception, danger, and shocking revelations. GCC: You’re best known for your work creating the legendary Stargate franchise. Will fans of your work in that universe have familiar touchstones to look for in Dark Matter or is it all unexplored ground? Mallozzi: Dark Matter is a very different animal from any of the Stargate series. I think that it’s far-future setting and unique character make-up make it distinct. Unlike the Stargates, Dark Matter is set in a region of space that has been colonized by Earth-based multi-national corporations seeking to exploit planetary resources. Space stations and manned worlds dot the various galaxies but, the further away we move from Earth center, the more likely we are to encounter the strange and the unknown. While the SG-1 and Atlantis teams were a like-minded bunch and the crew of the often-outmatched Destiny (from Stargate Universe) eventually came together in common cause, the characters in Dark Matter are a disparate collection of individuals – a little rough around the edges – who may not exactly see eye to eye a lot of the time. These are specifics that set them apart. In general, however, I think that one thing both Dark Matter and the Stargates have in common is an underlying humor and, ultimately, a sense of camaraderie at their core. GCC: What were your main sources of inspiration in creating the world and story of Dark Matter? Mallozzi: Ah, that’s a question I’ll field after issue #2. You’ll know why when you read it. GCC: Reading Dark Matter, I got a feeling of the darker edges of the Stargate franchise, namely Stargate Universe. Universe dealt with some of the bigger questions of life. “Why are we here?” “What created us?” That sort of thing. Will Dark Matter be delving into some of these concepts? Mallozzi: At first, our crew will seek answers to the more personal questions related to their respective identities. Who are they? What happened to them? Where are they going? And who the hell is trying to kill them and why? (But I get ahead of myself here). The loftier concepts won’t be explored in the same way they were in Universe (ie. the physical pursuit of a universal truth hidden in the background radiation of the universe) but will be a part of the crew’s journey of self-discovery. GCC: The art in the first issue has a very unique look and feel to it. How did you first get in touch with artist Garry Brown and colorist Ryan Hill? Mallozzi: Actually, both Garry and Ryan were brought to the table by my terrific editor at Dark Horse, Patrick Thorpe. Given the fact that I was a relative newbie to writing comic books, I didn’t feel right asking for a specific artist. Instead, at Patrick’s suggestion, I forwarded him images that I felt best exemplified the visual style and tone I was looking for in Dark Matter. I was familiar with Garry through his work for BOOM! Studios and readily agreed he was a perfect fit. His ensuing work on the series surpassed my already lofty expectations. I wasn’t familiar with Ryan but was totally blown away by his colors on the cover to issue #1 and, later, the completed first issue. GCC: I noticed design elements of Stargate, Mass Effect, and even a little bit of Logan’s Run in the first issue. What influence did you and co-writer Paul Mullie have on the look of the ships and designs of Dark Matter? Mallozzi: To be honest, much of the look of the series – the ships, the tech, the characters – comes from artist Garry Brown. I painted some fairly broad-stroke pictures of what I wanted to see but left Garry plenty of room for interpretation. He forwarded his initial sketches and designs to editor Patrick Thorpe who, in turn, sent them my way. I made some minor suggestions and they went back to Garry who made some minor adjustments. I really wanted Garry to really feel like he was a part of the creative process in helping to build these characters, this world. GCC: Finally, a must-ask geek question: if you could have any superpower, what would it be? Mallozzi: As I write this, I’m feeling like a guy who could use the ability to teleport – specifically, cross-country so I wouldn’t have to be waiting in this airport to board a five hour flight that has already been delayed two hours. We here at GCC hope that Mr. Mallozzi got that flight in time for the holidays. Thanks again to him, Aub Driver, and the other fine folks at Dark Horse Comics! Dark Matter #1 is out in comic stores and online January 11th. This entry was posted in Interview and tagged comics, dark horse, dark horse comics, dark matter, interview, joseph malozzi, stargate, stargate atlantis, stargate sg-1, stargate universe, television, US. Bookmark the permalink.